They were only on this run and not any of the lines in the area. And what is the function of the flat u-shaped guards in front of each? It's a fault circuit indicator. Specifically, it's the Sentient MM3 model which monitors the current through the conductor it's attached to. It also draws its power from the magnetic field resulting from the current passing through the line. It logs and can wirelessly transmit the data it gathers which helps the local electric utility in quickly pinpointing problems -- ideally in advance of the problem becoming an actual outage. For example, an intermittent fault could indicate a sagging tree branch hitting the line when the wind blows. The little metal circle thing is an arc shield from the same company. It's intended to save the sensor (which is not inexpensive) from a traveling arc, as from a lightning strike down the line. And no, I have nothing to do with that company but have some experience in the utility industry. Not the answer you're looking for? Browse other questions tagged mains high-voltage or ask your own question. Why are the high voltage overhead power lines with the same potential being isolated? On high voltage power lines, what is “residual power”? Why do ceramic insulators have a stacked disc structure? If a large AC generator is overloaded, will it lose frequency or voltage? Why are consumers located near high-voltage lines typically not connected to those lines but instead are connected through a lower high-voltage line? 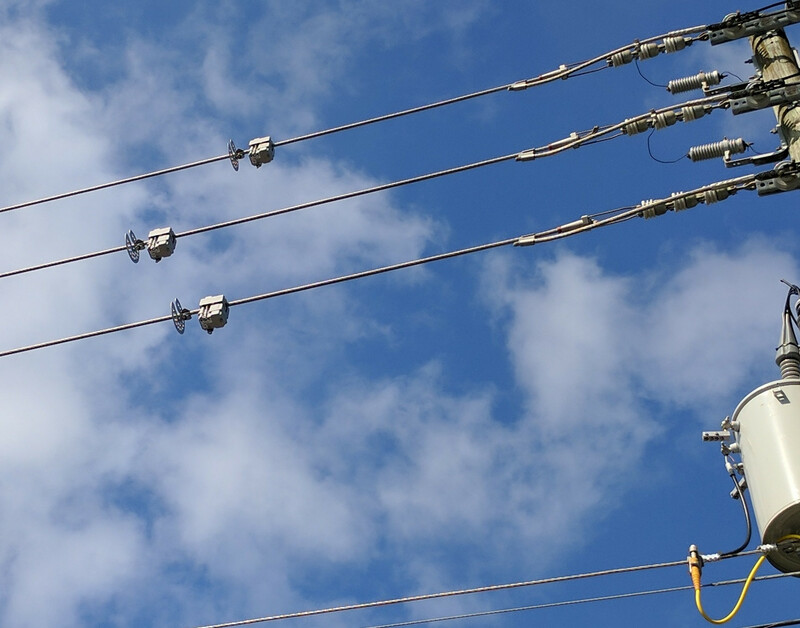 What are important metrics of high voltage power lines? What effect would a hydrogen bomb detonated at high enough altitude have on the power grid and solid state electronics? What is the effect on kWh if the power company reduces line voltage to a residence?